Diono Monterey: Back & Better Than Ever! It’s b-a-a-a-c-k! Back and better than ever is the Diono Monterey booster, seen here in review (and scroll down, as a giveaway!). It had disappeared from the market for about a year and we were very sad…and then thrilled to learn it was making a comeback! The Monterey is a favourite of techs, and for very good reason. 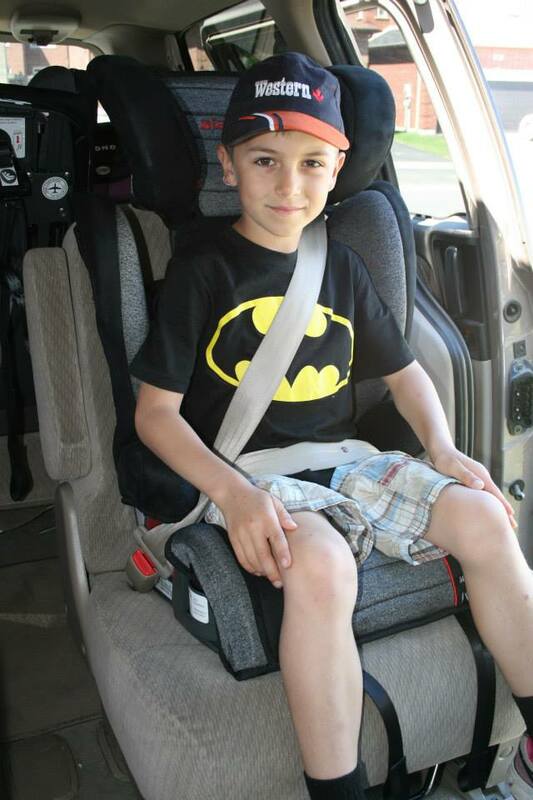 It is one of the tallest boosters on the market, kids find it very comfortable, and it generally provides excellent belt fit in a variety of vehicles. The Monterey retails for $160 and is available in a variety of places, including Shop.ca, Amazon, Toys R Us, and many specialty boutiques. It is currently available in three fashions: Bloom (pink), Surf (blue), and Heather (grey, reviewed here). The Monterey in high-back mode provided excellent belt fit on every child we tried. As always though, we do recommend always trying a seat before purchase if possible. The children we tested said they love how cushy and comfortable it is and the retractable cup holders. One 7 year old said she liked it even though it wasn’t pink – gasp! At 21″, the backrest adjusts to one of the tallest heights on the market, meaning it is a great choice for tall and long-torsoed kids who could still use the support of the back. 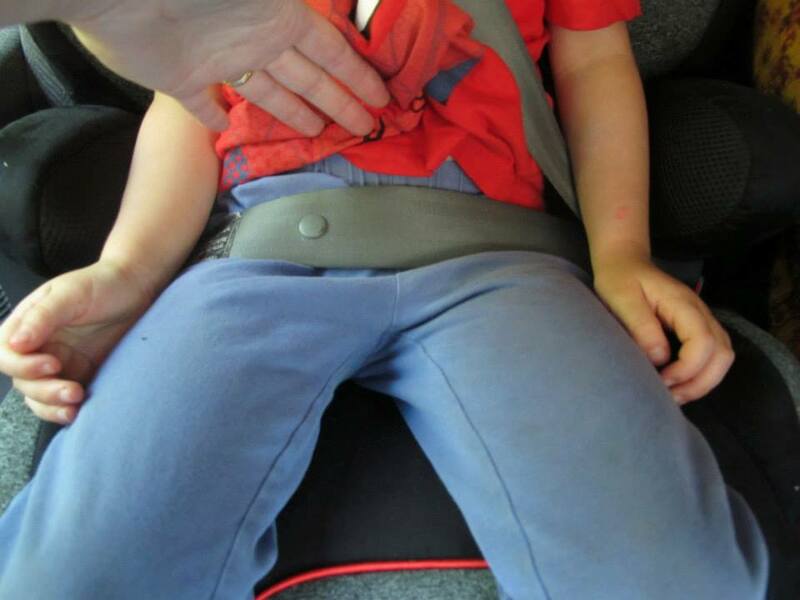 When evaluating belt fit of a booster seat to a child, you want to ensure the lap belt is low and flat on their thighs (not up high on the belly) and that the shoulder belt is centered in the middle of their collar bone. On the smaller end of the spectrum, the child below is five and is just 40 pounds and 43”. Her regular seat is still a harnessed seat. The lap belt fit was excellent and she declared the seat to be very comfortable. I appreciated the ability to adjust the side walls narrower. Another smaller child, at five, 42 pounds and 42” tall. Again, the belt fit is excellent and the seat pan gives lots of support to her legs. These two kids have very similar stats, at 50” tall and 51 and 55 pounds respectively. Again, excellent belt fit and they found it very comfortable. At 9 ½, 62 pounds, and 56″ tall, this child normally rides in a backless booster (and is clearly super thrilled to be testing this out in highback mode! ), but she is within the specs and still just fits. This would be very useful for a young but tall child who would still benefit from the support of the high-back, or for a child who still falls asleep in the car to give them somewhere to rest their head so they don’t slump out of position. 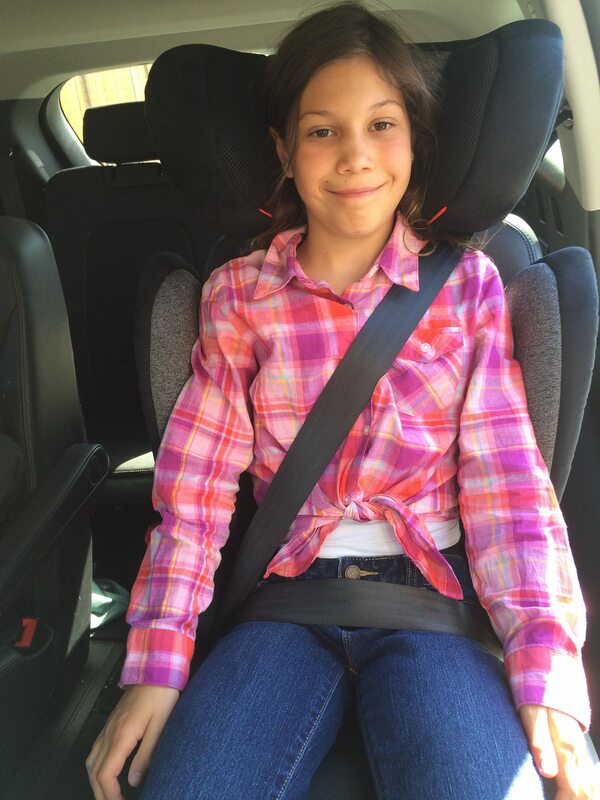 Road tripping with her family this 8 year old is 90lbs and 4’8″ (54″) tall and prefers to have the back on the 2012 version of the Monterey (virtually unchanged except for the style of the upper belt guide so we included this photo for comparison). Using the Monterey as a backless booster may or may not work for your child/vehicle combination. When buying a seat now for a 5-6+ year old it is hard to predict their build, or know for sure what you will drive, when they have outgrown the back and need to use it backless. Pictured here without the back we don’t like the belt fit on the lap belt; it’s too low on the legs and isn’t making contact with the hip bones — because without the back portion on the child has scooted back away from the belt. If you do find that is the case consider a backless booster such as Diono’s Solana, or another option well-suited to your child. The Monterey also worked exceptionally well in most seating positions and vehicles that we tried. It does have UAS hooks to latch the booster into the vehicle with an up-front adjustment mechanism to tighten and loosen each connector. This does not provide any extra safety to the booster rider, but does mean that the booster seat isn’t a projectile when not in use, and is a convenience feature that we find, well, convenient! Use of UAS is an optional feature, and if you don’t have UAS in the position you use the booster in we always recommend buckling the booster in when not in use. Sometimes with high-back boosters the shoulder belt won’t always retract properly through the belt guide. This is not ideal as the belt won’t be in a good position to keep a child restrained properly if, for instance, the child has leaned forward (hopefully while the car is not in motion!) or if you have had to brake suddenly. Compared to previous versions of the Diono and Sunshine Kids Monterey this revamped Diono Monterey has a redesigned belt guide that tends to be very friendly with most shoulder belts. We found it worked very well in most of the vehicles/seating positions that we tried, including one position where the belt comes at an awkward angle that generally doesn’t work with high back boosters. We did find one seating position in one vehicle where the belt didn’t retract, but in general the Monterey would be an excellent bet. Diono wants the Monterey seat back to make contact with the vehicle seat and to minimize gaps; if there is a gap, they have advised to contact them for evaluation. Some larger or fixed and forward-leaning head restraints may create too large of a gap to be safely used with the Monterey but as vehicle geometry varies so widely it’s best to leave the decision making to the manufacturer. Take a clear photo or two from more than one angle and let them evaluate the fit for you. The Monterey does require vehicle head support behind it, even in high-back mode, so it is not an option for vehicles with no head restraints. 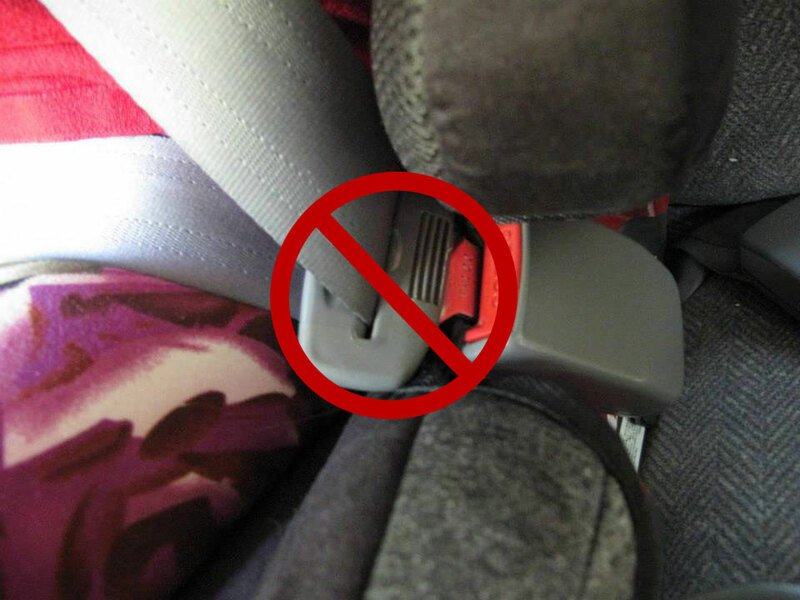 Diono does not allow the vehicle’s buckle to cross the lower belt guide, so it also may not be an appropriate choice if your vehicle has very long buckle stalks. 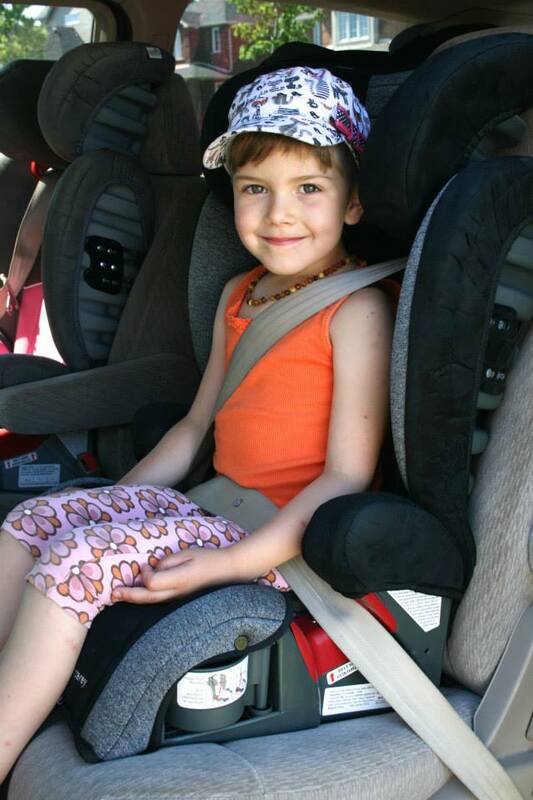 The Monterey is an excellent booster seat that is loved by technicians, parents and kids alike. It provides excellent belt fit on a large range of children, is one of the tallest high-back boosters on the market with one of the highest weight ranges, and has features to make it a comfortable and convenient seat to use. It is not the seat for you if you need a booster in a position with no head restraint or if your vehicle has exceptionally long buckle stalks. It may not work if you have fixed, forward-leaning head restraints. As always, if possible try before you buy to ensure it fits your child in your vehicle. Thank you to Diono for providing the seat shown in this review. All opinions are our own. 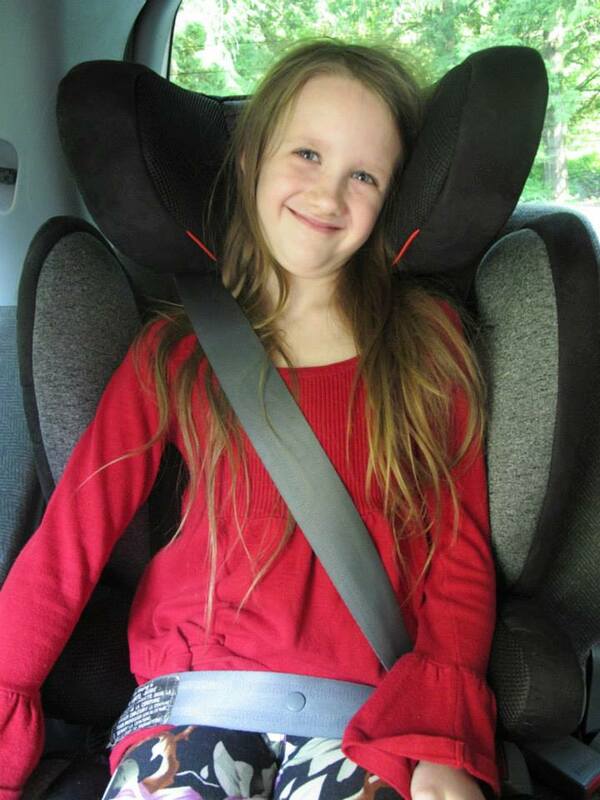 Thank you to Diono for providing one booster seat in “Heather” fashion to one lucky reader! 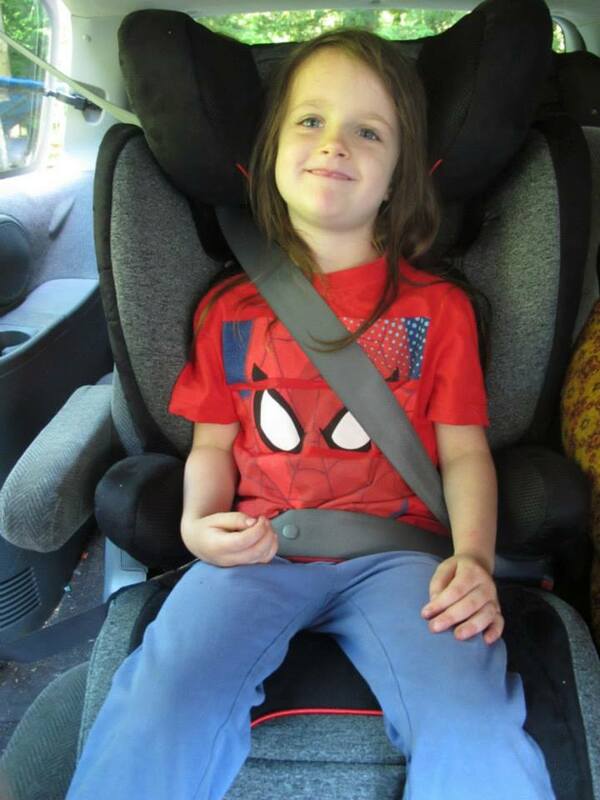 Please remember that booster seats aren’t an appropriate option for a child until s/he is consistently over 40lbs, and has the maturity to sit properly in position at all times, usually beginning around age 5-6+. Do you have such a creature? Please enter! 122 comments to Diono Monterey: Back & Better Than Ever! I NEED this for my 7 yr old. Posted to soon 🙁 looking for maturity and the ability to sit correctly 100% of the time. Also that they meet the requirements of the booster by height and weight and that the booater fits in your vehicle correctly. I love the UAS so I don’t have to remember to belt the seat back in after dropping the kids off. I have a few years before needing a booster for my kids but since I carpool a lot having a dedicated booster for my vehicle would be ideal. Thanks for the review.! Always looking for a seat to try out and with my LO nearing bolstering I’d love this! Belt fit and not sleeping from time to time! Great looking !! Would love one. My oldest our sticking point was 40lbs. She had the maturity at 5.5, but didn’t hit a solid 40lbs consistently until nearly 7. My middle right now has the weight (44lbs), and has pretty good maturity at 5, but is a horrible sleeper. Her head falls completely forward every single time she sleeps. So we are going to do some booster training shortly in town for short trips, but keep her harnessed for any trip over 15 minutes or when naps are likely. I’ve got a 6 year old who would LOVE this for Nana’s car! I bet Nana would love it too. Any child who wins this should be able to sit properly at all time, be consistently over 40lbs and be at least 5 years old. I’m looking for maturity. She needs to be able to sit properly every second of every drive. Legal minimums, plus bring mature enough to sit in position the entire ride. my 7yo could desperately use an upgrade that will enable him to ride safer longer! Thanks for the review, we’re just starting to consider moving our 6yr old to a HBB so this would be great! I have a very tall 3 year old. He weighs as much and is as tall as the 5 year Olds that tested out this seat. His current seat goes up to 56″ but he may outgrow that sooner than hoped as it is on the last setting for height. This would be great. I have two, possibly THREE of those creatures. My oldest is just about ready to move from 5pt to booster – we would love one of these for her! Hitting the right height abd weight for the seat as well as the maturity to sit in it properly for the duration of the ride. Maturity to sit correctly, which my almost five year old is great at! A child MUST be 40 lbs (MIN by law), should have outgrown the limits of their harnessed seat, be able to sit still the entire duration of the trip without leaning or reaching for objects, must be able to stay awake to not slump over in seat…I could go on and on. For our family…harness to AT LEAST 6 yrs. Maturity to sit correctly, which my almost five year old does well! Would love to have one!!! Looking for my “big” girl to be able to sit correctly all the time, and her weight to go up before a booster. That will be for in our car of course, waiting for her to meet the requirements of whatever booster we decide on for in grandma’s “in-town” only vehicle. Would love to start booster training with this nice tall booster for my super tall kid! He needs to stay upright at all times and not lean over when sleeping! The belt needs to lay across their hips and squarely on their shoulder. love this. I’m going to look for one locally. Always looking to see if my child will sit tall and leave the seat belt on her shoulder. Also that she will not unbuckle when she should not. Also that she is over 40lbs. My son is 6, but until very recently has been too wiggly for a seatbelt alone. He’s almost too heavy for his harness though, and a taller booster would be welcome! This would be amazing in my van for my nieces and nephews and my granddaughter! The maturity to remain in position as well as a bit of growth! We are no where near 40lbs here. love the look of this booster! For booster readiness, I’m looking for: ability to sit in proper position for the whole trip, even if sleeping; at least 40 lbs and over 5 years of age (my preference is around 6); good belt fit. A very informative review. We would love this seat! This seat sounds amazing!!!!! I love Diono seats and this would be perfect for my oldest son! Knowing that my 5 1/2 year old NEVER sleeps in a car seat, she meets all the requirements. It’s nice to read that this seat got good results in the ADAC tests in Germany which, apart from crash tests also tests for chemical substances in the seat which was also satisfactory. Sounds like a great seat! Thanks for the opportunity to win one! Besides meeting the height/weight requirements, my children need to be able to sit properly the entire trip, even when sleeping. My son is almost ready for a booster and this one would be great! Great review! Would love to win this for a family member! This would be great to use for my 7 year old and also my approaching booster training 5 year old . Will be looking for great belt fit , as well as my children being within the height and weight ranges for the seat. Maturity to delay reactions when upset. I am a diono fan, my kids almost at the right age and size for this. She will be changing soon. For my next booster age child I’ll be looking for maturity – she’s 4 now and would not be able to resist moving around. I am encouraged to see such a thoroughly designed booster! My next booster kid is very tall (will be out of the radian 65 soon), but I’d still like her in something with great support like this one. Height and weight aside (that’s just not negotiable, to me), beltfit is my most important factor. An improperly fitting, or worn, belt is just too dangerous. My 5 year old daughter is wanting to start using a booster on short trips with my parents. This seat would help be feel comfortable with that idea. with 6 boys,2 of which are ready to transition to a booster this would be fabulous!! Looking for my girl to be able to stay properly in position with good belt fit before we move to booster! maturity to control their actions, like not leaning over while the vehicle is moving to pick up a toy they’ve dropped. Would love this for my 7yo! Booster training this summer to make sure she can sit proper each and every time! Belt fit, weight and maturity! Maturity (no wiggling about) and how it fits (centre of shoulder and across hip/thigh). We have Diono Cambrias in both vehicles now. The Monterey with the adjustable recline on the back would work much better in our Altima. Sheesh, I would fit in this seat! Looks amazing! Just realized two of my kids seats are expired. 🙁 I need to win this. This looks like a great seat. I would love one for my super tall girl. She will be outgrowing her 5 point seat soon. We will be looking for maturity, proper belt fit , as well as making sure we have hit the right weight and height requirements. What a great give away. I would love this for my little guy!! Would love, love, love this! I have a very tall daughter so she is going to need something that will fit her for a Lon time and this seems like the seat to so that! I have a very tall girl and this seat would be perfect to see her through the booster stage!!! I was very excited to see this review! I just purchased this as my daughter is about ready to move from a booster just in time as will need her seat for my other little! Could really use this in my second vehicle! 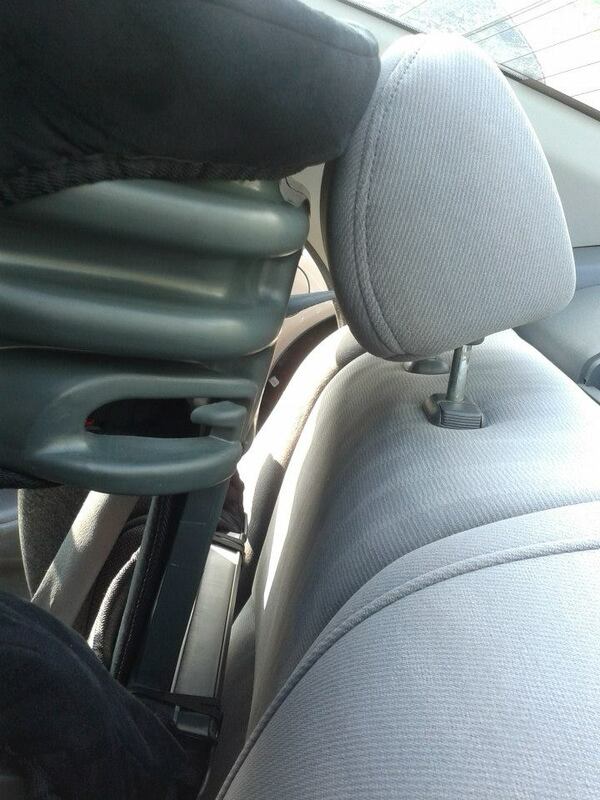 I was glad to read about needing the headrest. Thanks for a great review. Minimum legal requirements, maturity & seat requirements. I’m waiting until my 6 year old gains some weight (39lbs) and has a proper belt fit in the right booster! She is already mature enough I believe. Correct fit and ability to stay in the correct position. Maturity is the big thing, to sit straight without moving, not being silly, etc. Meeting the ‘minimums’ of the booster seat just isn’t enough, IMO. This looks like a great seat that fits a variety of sizes and ages, would love to win. I own a Monterey already and it is by far my favourite booster for consistent great belt fit e en when sleeping. The UAS is an added bonus! My son is ready for a booster because he is over 40 lbs and has maturity to sit properly in position at all times! Would love this booster!!!! Would love to win one of these who will be moving to a booster soon! We need this in our lives! Looks like a great seat and I know diono is a leader in car seat safety! This looks like it would be perfect for my big 6 year old. This would really benefit the young girl I care for! She isn’t quite ready for a backless but is on the cusp of outgrowing her TurboBooster in high back mode! I have two 5-year-olds that use Diono car seats and I love them! I want to make sure that they can sit up straight and for periods of time. In addition, I need to make sure that they don’t fall asleep because they slump over. As my 5yo is approaching 40lbs we are talking about sitting maturely in his seat at all times. He’s a little taller than his big brother was at this age, so I’m gathering he’ll max out on height in his Radian within the next year. What a great giveaway!! 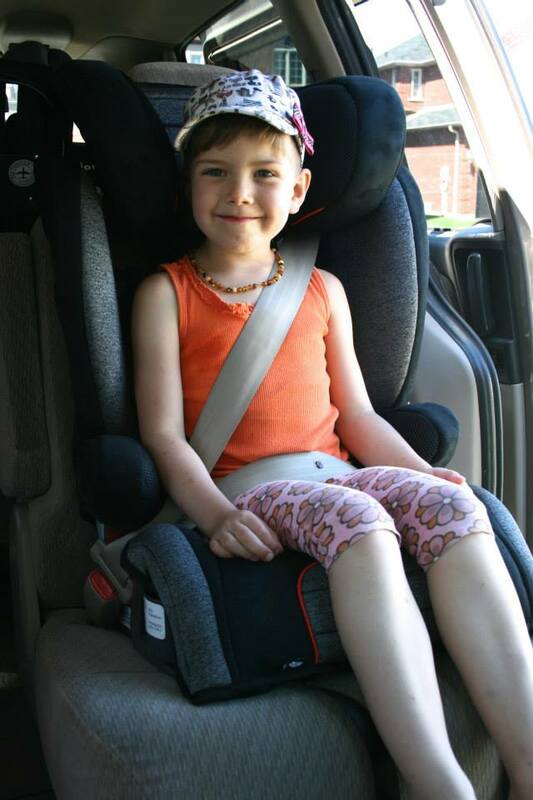 For booster seat readiness we look for maturity, belt fit and meeting all of the minimums. A second booster seat for grandmas car would be perfect, thank you! Most important is that my daughter meets the physical requirements of the particular booster and in addition to being the proper size, that she is mature enough to sit with a seat belt restraint. We are almost ready for a booster and this one seems like a good fit for our girl. This would be perfect for my little-big guy! He meets all requirements but couldn’t find a high back booster that I felt confident in enough to put him in. This seat makes me feel he would be safe and protected in. Im looking for my eldest (5 years) to meet minimum legal limits (40 lbs at least), be mature enough not to fool around in his seat or slump sleep, that he fits in the seat properly, and outgrow his current harness seats. His main seat will last for many years but both our backups only harness to 40 lbs. Just beginning to look for a booster seat and this sounds perfect for our needs! This would be perfect for my big guy, he will be 6 on Friday and has been booster training for the last little while! Being able to sit in the proper position for the whole ride and weight at least 40 pounds. Would love to win this for the 7 and 9 year old I nanny, it looks like it would be a great fit for both! I’m totally buying one!! Thanks! Hi, would definitely make sure they fit within the weight/height requirements of the seat and to make sure they are mature enough to sit properly. Would be nice to have an extra seat for daycare kids. I waited until my children were mature enough (5 ish) to sit in place, well over 40 lbs. We have 1 older style Monterey that my 3 booster riders fight over, it’s definitely a favourite booster! When my wife, the car seat tech, tells me it’s time! Min age 4, 40 lbs, and mature enough to not move and wiggle around in the seatbelt vs. the harness. More than a Parkway I’d think, but I also looked recently and can’t find a listed weight. Best to ask Diono directly. « Harmony Defender: Whole Lotta Love!